I love when something comes full circle. We felt released to leave a church once, it was right around Easter. We eventually left the area and lost contact with all the people we loved. Seven years later, on Easter Sunday, we returned for a visit. In the meantime, there had been many changes. The pastor was caught cheating on his wife, divorced her and left the pulpit. Several thought we were visiting because we had heard what happened. We hadn’t, we just missed everyone. They had just spent a solid year struggling and were rejoicing at their Easter closure. It felt like a gift or poetic justice, and we were so happy. 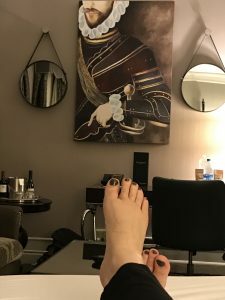 Here’s a picture of my toes in a hotel in San Fransisco in 2017 about a month before the Dance of the Crane Series began releasing. It was for an annual conference my husband attends (and I tag along.) I’m not even sure why I took the picture. I was feeling melancholy. Not just melancholy, to be honest, it was the start of a very difficult time for me. There were a number of changes in my life, an identity crisis or two and lots of Psalms 55:17 going on. One year later, this past April, I went with the expectation that I would receive the same kind of closure we got at that church. I wasn’t hopeful or anticipating God. I was EXPECTING. I can’t even tell you how horrible the trip was. But I flew home the second day. Since then, not much in my circumstances have changed, but I can tell you that I am changing. And, I’m starting to write again! I still get requests for the third in the Breaking Bonds Series. I cannot say when that will happen. But stay tuned. I am so happy your writing again. Thank you, Lord. A gift from God should be used often.